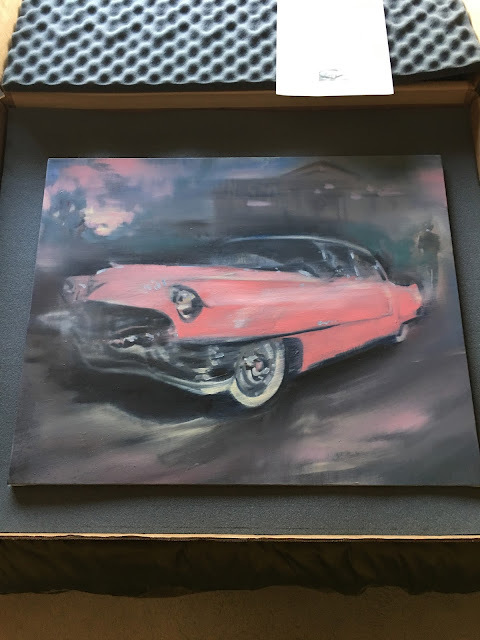 My paintings Pink Cadillac (Elvis at Graceland) and Memphis Train (Arcade Restaurant) have just arrived at the L Ross Gallery in Memphis, Tennessee for my latest exhibition. They will join my painting Suspicion (Elvis Presley) in the exhibition Elvis Has Left the Building which runs from August 2 - 31. 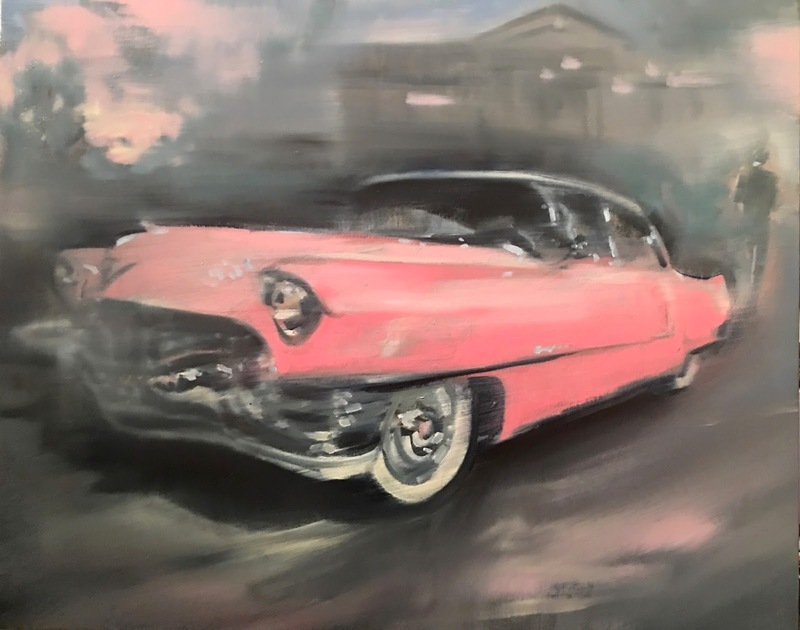 This group show, which has become a notable annual event for the L Ross Gallery, will kick off with an opening reception on Friday, August 4 from 6 – 9 pm. In my recent Clark Hulings Fund podcast with Daniel DiGriz, DiGriz caught me implying that Elvis is alive. On the walls of the L Ross Gallery this August, Elvis does live on, but as Fredric Koeppel writes,"his memory is slowly fading and becoming the stuff of rumor and legend tending toward oblivion." The show title makes this poignantly clear. I have been reading Ray Connolly's new book Being Elvis: A Lonely Life which deftly examines Elvis' life through the lens of Memphis in the 1940's and 1950's. 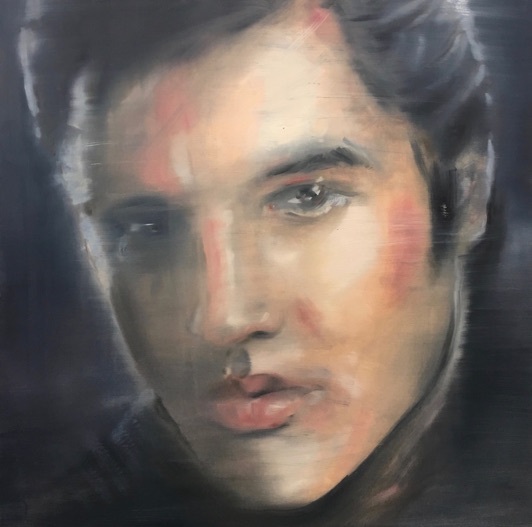 Childhood poverty and class aspirations spurred Elvis on in a way that left no room for error in his art but left his life dangerously open to misfortune and eventual tragedy. At the Mississippi-Alabama Fair and Dairy Show in Tupelo, Mississippi on September 26, 1956, Elvis played a powerful, homecoming show in the town where he was born in a two-room shack 21 years before. Elvis had left Tupelo when he was thirteen. 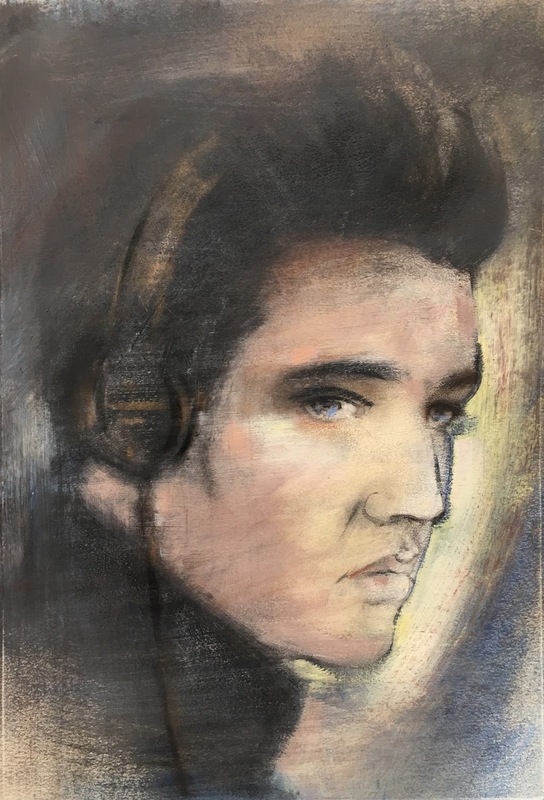 In the interim, Elvis had become Tupelo's most famous person. As Ray Connolly recounts in Being Elvis: A Lonely Life : "Elvis put on a special show that day...It was staged outside the fairgrounds in front of a large tent, and, as he sang in the afternoon show, he could see over in the background, a long freight train rolling past." Starting on that day, as the concert closed, Elvis and the band slipped off stage through a trap door. No encores that day nor in the future. Instead an announcer would express over the PA system that "Elvis has left the building." 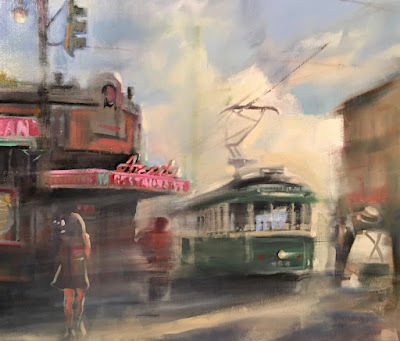 My painting Memphis Train (Arcade Restaurant), is steeped in the musical history of the city and pays homage to Jim Jarmusch's 1989 film Mystery Train. The Arcade Restaurant which graces the painting is a major player in Jarmusch's cinematic ode to Memphis and Elvis. Across the street from the Arcade is Memphis Central Station which opened for railroad service in 1914. My painting reflects the rich, diverse past, present, and future of Memphis. 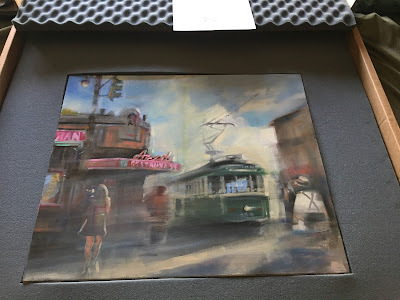 I listened to the Junior Parker song Mystery Train, which supplied Jarmusch his film title, as I painted. I also listened to Elvis' cover version of the song. Two brilliant renditions. The city of Memphis itself tells many deeply American stories. Memphis can claim an important role in the development of the Blues and Rock n' Roll. The legend goes that W.C. Handy, who lived in Memphis from 1909-1917, wrote one of the earliest blues songs, St. Louis Blues, in a bar on Beale Street in 1912. During the 1940s and 1950s, Memphis was home to B.B. King, Junior Parker, Johnny Ace, and Joe Hill Louis. R&B and gospel music label Duke Records began in Memphis in 1952. 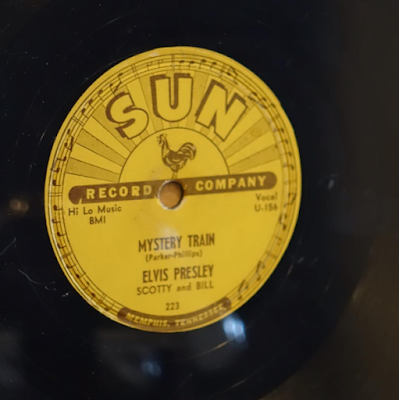 Also in 1952, Sam Phillips started Sun Records, the seminal early rock and blues home. Elvis Presley, Johnny Cash, Carl Perkins, Jerry Lee Lewis, Muddy Waters, Howlin' Wolf, Ike Turner,, and Roy Orbison created powerful early recordings at Sun Studio. 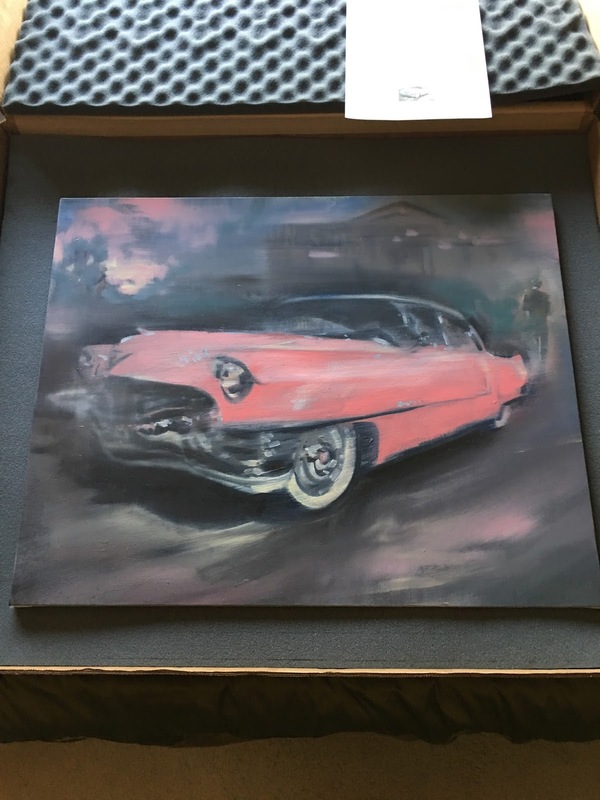 My painting Pink Cadillac (Elvis at Graceland), like many of my artworks, went through a process of change and revision. Like a time traveler drifting into the past, Pink Cadillac, began in our present era and shifted as the painting developed back into the 1950's. As if in a dream, I found myself in front of Graceland watching Elvis slowly walk away. Knowing that Bruce Springsteen had written his song Fire especially for Elvis, I listened to a mix of Bruce and Elvis as I painted. As Ray Connolly writes in Being Elvis: A Lonely Life: "at the time of Elvis' death" Springsteen was trying to get the song to Elvis in Graceland. Springsteen never learned if it reached the King. Springsteen when remembering his childhood expressed that "I couldn't imagine anyone not wanting to be Elvis Presley." Springsteen's fandom reached a pinnacle when after a concert in Memphis on the Born to Run tour in 1976, Bruce jumped the wall outside Graceland that night and made it to the front door hoping to meet Elvis in person. Security guards told him that Elvis was in Lake Tahoe and not available and then escorted him back to the street. Springsteen described the night, "'And it took us out there in the middle of the night, and I remember we got outta the cab, and we stood there in front of those gates with the big guitar players on 'em. And when we looked up the driveway, in the second story of the house, you could see a light on, and I figured that Elvis has gotta be up readin' or somethin'. And I told Steve, I said, 'Steve, man, I gotta go check it out.' And I jumped up over the wall and I started runnin' up the driveway, which when I look back on it now was kind of a stupid thing to do because I hate it when people do it at my house. 'Anyway, at the time, I was filled with the enthusiasm of youth and ran up the driveway and I got to the front door and I was just about to knock, and guards came out of the woods and they asked me what I wanted. And I said, 'Is Elvis home?' Then they said, 'No, no, Elvis isn't home, he's in Lake Tahoe'. So, I started to tell 'em that I was a guitar player and that I had my own band, and that we played in town that night, and that I made some records. And I even told 'em I had my picture on the cover of Time and Newsweek. I had to pull out all the stops to try to make an impression, you know. I don't think he believed me, though, 'cause he just kinda stood there noddin' and then he took me by the arm and put me back out on the street with Steve. 'Later on, I used to wonder what I would have said if I'd knocked on the door and if Elvis had come to the door because it wasn't really Elvis I was goin' to see. But, it was like he came along and whispered some dream in everybody's ear, and somehow we all dreamed it. And maybe that's why we're here tonight, I don't know. I remember later, when a friend of mine called to tell me that he'd died, it was so hard to understand how somebody whose music came in and took away so many people's loneliness and gave so many people a reason and a sense of the possibilities of living could have, in the end, died so tragically. And I guess when you're alone, you ain't nothin' but alone." Elvis has indeed left the building, but the echo of his presence remains.